Get moving with our COMPLIMENTARY workout session by Health Promotion Board! Theme for April: Strong by Zumba! Gather your colleagues, friends and family and get moving! The complimentary workout session organised by Health Promotion Board is happening every Wednesday at the Urban Plaza (near Decathlon). In the event of wet weather, the work out will be conducted at Block 750E, Lobby 2, Level 5. 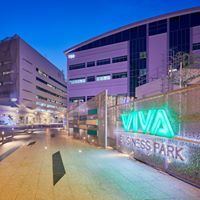 Follow and Like our Facebook page - Viva Biz Park to keep updated on our latest updates, promotions and events!